CHICAGO--(BUSINESS WIRE)-- Hyatt Hotels Corporation (NYSE: H) today announced the opening of the 257-room, full-service Hyatt Centric The Loop Chicago, the first Hyatt Centric branded property to open worldwide. The hotel will deliver on the brand’s mission of putting its guests at the center of the action in the best destinations. Hyatt Centric The Loop Chicago is owned by Integrated Clark Monroe, LLC and managed by Interstate Hotels & Resorts. Hyatt Centric The Loop Chicago is in a 22-story, 1927 art deco office building designed by Frank Chase, located at 100 W. Monroe St. in downtown Chicago. The property has undergone a transformative renovation into an iconic new hotel while maintaining the integrity of the building’s roots and preserving its historical details. One feature of the property is the adaptive reuse of the original landowner and farmer Willard Jones’ cow path that was used to herd cattle – now it is a special walkway that leads locals and guests to the hotel’s rooftop bar. 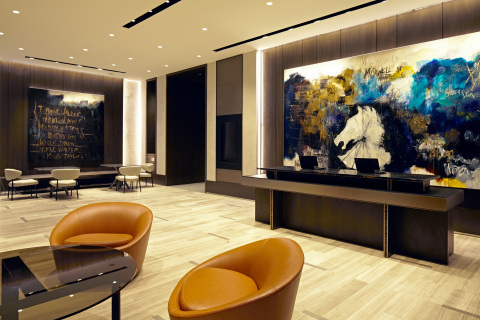 The hotel features 2,513 square feet of meeting space with each conference room named for an influential figure in the Loop’s history: famed industrialist Charles Yerkes; landowner Willard Jones; author Frank Norris; and sculptor Alvin Meyer. The hotel will offer guests multiple dining options, including a seasonal rooftop bar, AIRE, with creative signature cocktails, contemporary and eclectic décor and panoramic views of the Chicago cityscape. It also features an upscale French bistro, Cochon Volant Bakery Brasserie and Bar, serving gourmet cheeses, fresh baked goods, organic juices, and culinary masterpieces by James Beard award-winning Master Chef Roland Liccioni. The modern and urban guest rooms balance the energy of the city with a calm, inviting respite through minimal but upscale features, which include unique bathroom designs with private showers and water closet areas. Located in the famous Loop neighborhood, the hotel is within walking distance of Millennium Park, the theater district and world-class shopping, putting guests in the heart of the dynamic Windy City. An authentic entryway to the destination: From the eclectic and fun hotel design to colleagues who are explorers themselves, Hyatt Centric hotels will be the perfect launching pad for travelers to explore interesting destinations.